Back cover blurb: What would you do if your closest friend tried to steal your life? A chilling new novel from the prize-winning author of No & Me – a Richard & Judy Bookclub selection. Today I know that L. is the sole reason for my powerlessness. And that the two years that we were friends almost made me stop writing for ever. Overwhelmed by the huge success of her latest novel, exhausted and unable to begin writing her next book, Delphine meets L. L. is the kind of impeccable, sophisticated woman who fascinates Delphine; a woman with smooth hair and perfectly filed nails, and a gift for saying the right thing. Delphine finds herself irresistibly drawn to her, their friendship growing as their meetings, notes and texts increase. But as L. begins to dress like Delphine, and, in the face of Delphine’s crippling inability to write, L. even offers to answer her emails, and their relationship rapidly intensifies. L. becomes more and more involved in Delphine’s life until she patiently takes control and turns it upside down: slowly, surely, insidiously. 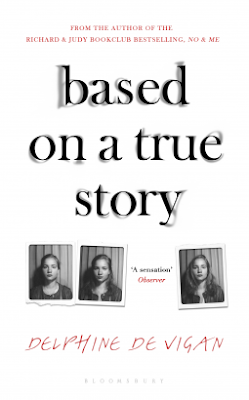 Based on a True Story is a chilling novel of suspense that will leave you questioning the truth and its significance long after you have turned the final page. Delphine De Vigan is an award winning French novelist, but her creative flow is seriously compromised when she meets L at a party. L's true identity is never revealed, but what we do know about her is both terrifying and shocking in equal measure. Despite her popularity Delphine is prone to boughts of social awkwardness, a childhood shyness she has never shaken off. That is except at parties where she somehow has the capability to literally dance like no one is watching. It is via her dancing that L bursts into her life, admiring Delphine's moves and flattering her until L has seamlessly worked her way into Delphine's life. L calls even though Delphine knows that she didn't hand out her number. But instead of being outraged Delphine is flattered. L has lots of contacts, she knows everyone. Why shouldn't she have Delphine's number if she wants it? But this is just the beginning of what turns very quickly into a toxic friendship. L dominates Delphine's life to the extent of warning her friends away (without Delphine's knowledge) and trying to take over her literary work. By the time Delphine realises that L is potentially dangerous it is too late, and they are holed up in the countryside together under the pretence of resting Delphine's sprained ankle. Delphine realises that she must get away from L and get her life back, but who is going to believe her story when no one even know who L is? Based on a true story I don't think is a novel that everyone will engage with. What happened to Delphine is truly horrifying, but that doesn't make it a novel that will appeal to all. So whilst I enjoyed it, I must say I didn't love it - but then maybe it just made me feel uncomfortable - and I'm pretty sure that is what the author set out to do, because none of us want to experience an L for ourselves.